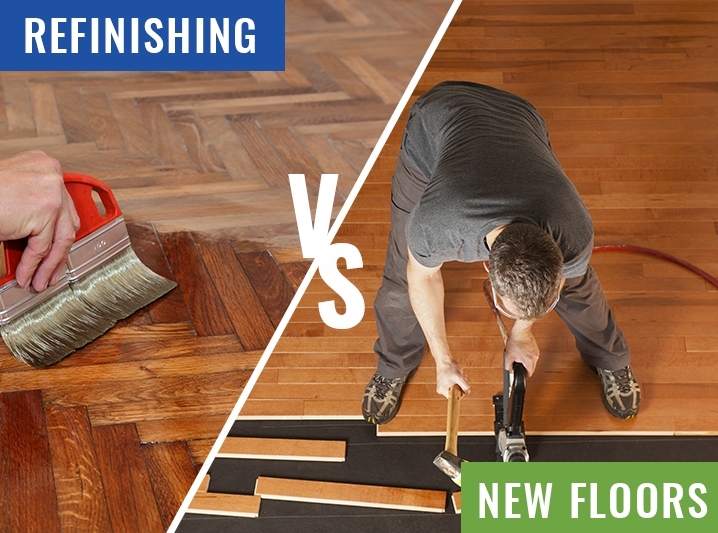 Refinishing Hardwood Floors or Installing New Flooring: Which is Better? If you wish to change the species of wood or the width or direction of the planks, then installing new wood would be the only option. Popular hardwood species choices include Oak (red and white), Maple, Hickory, Black Walnut, Brazilian Cherry, Beech and Ash. Whether you prefer wide or narrow planks depends completely on personal preference. Refinishing hardwood floors is a lengthy and dusty process. It can take several days and during that period no furniture can be placed on the floors and you cannot walk on them either. Added to that, the refinishing process produces a lot of dust and obnoxious fumes. On the other hand, it is quite easy for you to still stay in your home as the new floors are installed and they wouldn’t produce nearly as much dust or fumes as refinishing would. At the end of the day, whether you choose to have new hardwood floors installed or you decide to refinish your existing flooring, the choice is all yours. Both methods have their pros and cons. If you’re moving into a new home, refinishing your hardwood floors is a lot easier than if you already live there. And of course, refinishing floors is less expensive than replacing them. Whatever option you decide, Newgen Restores has you covered. Visit our warehouse or our website to learn more about creating your perfect floors.